Instead of sugar get your sweetness from real foods like bananas, apples and dates. You can puree them and keep it in the fridge. Then later take just a little (about 1 tablespoon) and mix into some greek yogurt … Awesome!! Add some cinnamon … this super spice adds subtle sweetness while boosting immunity, without calories … Yes, This is Great!! 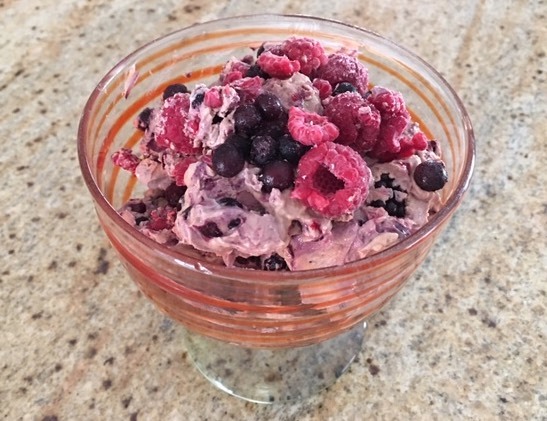 Now add some frozen blueberries and raspberries … King Antioxidants that are good for heart health, they help lower blood pressure, protect against aging, cancer and other diseases, plus so much more … I’m Getting Healthy!! PS… don’t forget a little fat, like almond butter, It helps slow the natural sugar absorption from the fruit and keeps you satiated longer … Bonus!! Imagine that … NO table sugar or any other sugar substitutes and I’m Really Loving It … Amazing!! One day at a time … start cutting out sugar … For a Healthy, Fit Body!! !